Map reports show Address field data and other related information on a map. Choose a table from the Table bar. This table must include at least one Address field. Click Reports & Charts to open the reports panel, then click + New. The New report or chart dialog will open; select Map. The report settings page opens. In the Basics section, give the report a unique Name. Add a Description for the report (optional) and opt to show the description on the report page. In the Map Details section, select the Address Field you wish to use for this report. Select the type of map you wish to display from the Map Type dropdown. Available options are roads, satellite, hybrid, terrain, high contrast, and roads at scale. 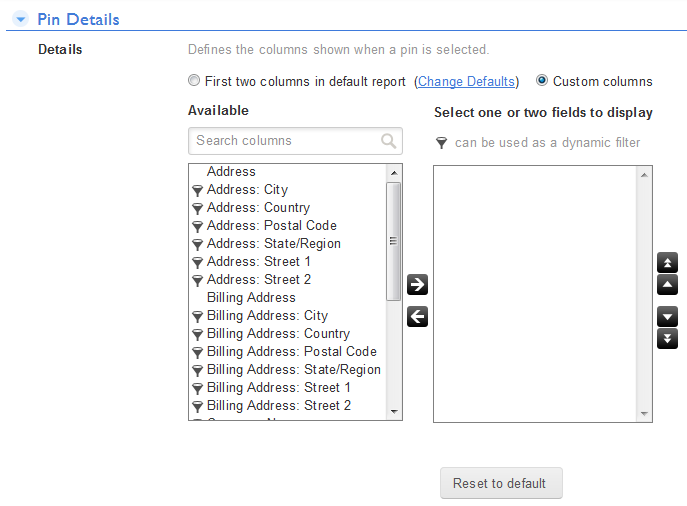 In the Pin Details section, define which columns are shown when a user clicks or hovers over a pin on the map. The default shows the first two columns in the report. You can change that default by clicking Change Defaults. If you do not wish to use the default columns, select the Custom Columns radio button and select the columns by moving the fields from one dropdown to the other. The Filter icon ( ) indicates which fields may be used as dynamic filters. All subfields of address fields act as dynamic filters. The subfields are shown after the colon in the field name, for example: Address: Postal Code. Sometimes, you may wish to include specific information with each pin. For example, you could show the customer name and their annual sales revenue. To do this, select Define a calculated column. Give the column a descriptive label, such as “Annual Sales.” Since this value is a number, you can select a numerical field type, and you can specify how many decimal places to include in the displayed value. In the Formula text box, enter the formula you wish to use to calculate the customer’s annual sales revenue. More about Formulas. In the Filters section, define what data is presented in the report. More about filters. At any time, you can display the map as it will appear with the current settings by clicking Display in the Page bar. To save your report settings, click Save in the Page bar.